Spring is officially here, and there’s no better place to confirm the good news than Central Park, where the season brings a burst of color to every corner of the park’s 840 acres. Warmer weather brings beautiful blooms and a flurry of activities and events along with photogenic landscapes. 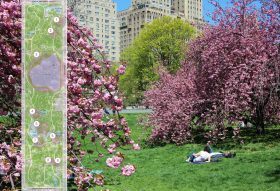 The park’s Spring Guide has all you need to know about the park’s prettiest places to visit; a handy map points out where the blooms are, and you can search for your favorites and learn more about them. There are also events for families, Conservancy members and the general public that will help you make the best of the season’s beauty. 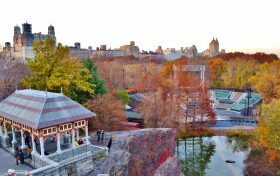 New York City boasts more than 1,700 parks, playgrounds, and recreational facilities covering upwards of 14 percent of the land across all five boroughs. This sprawling network of greenery falls under the jurisdiction of the NYC Parks Department. Once the storied provenance of Robert Moses, the Department functions today under the less-Machiavellian machinations of Mitchell Silver. 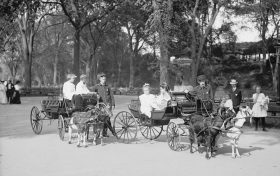 Though no longer the fiefdom it once was, Parks still operates out of a medieval fortress known as the Arsenal, a commanding bulwark stationed in Central Park at 5th Avenue and 64th Street. 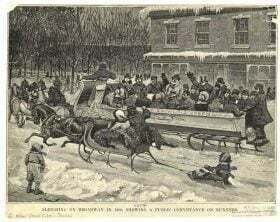 The Arsenal also houses the Arsenal Gallery, the City Parks Foundation, the Historic House Trust, and the New York Wildlife Conservation Society. This wide array of agencies reflects the varied legacy of building itself. Since construction began on the Arsenal 1847 (completed 1851), it has served a stunning array of purposes, from police station to menagerie to weather bureau. 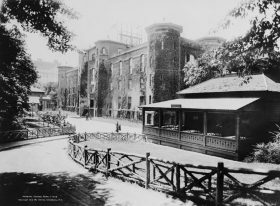 The Arsenal has had time to live so many lives: it is one of just two buildings in Central Park that predate the park itself, which was established in 1857. 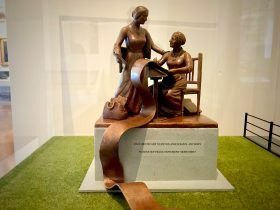 Hear more history of this historic headquarters! 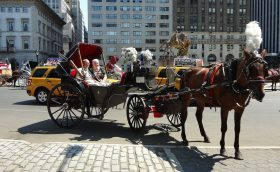 Manhattan Supreme Court Judge Arthur F. Engoron ordered Tuesday that Mayor De Blasio can’t “take any action or inaction that would interfere” with the horse carriages operating in Central Park until a subsequent court order is issued, according to the New York Daily News. The court order is the result of a complaint filed in October by horse carriage hack Giovanni Paliotta, whose attorney says the process was being done in the wrong order: New rules regarding the carriages should come from the City Council rather than the mayor, and legislation should be passed. 1930s New York brought us many things: Superman, the Rockefeller Center Christmas Tree, Joe DiMaggio, and, of course, goat beauty pageants in Central Park. Following the repeal of Prohibition in 1933, the Brewer’s Board of Trade was eager to revive the springtime tradition of Bock Beer festivals and put out an appeal for the most gorgeous goats in Gotham. The goats would go horn to horn in beauty pageants in Central Park to claim the title of “Mr. Manhattan,” and the right to return to the park for regional competitions to determine which beautiful Billy Goat would be “Mr. Bock Beer,” the brewer’s mascot, and the face of ubiquitous bock beer advertisements. 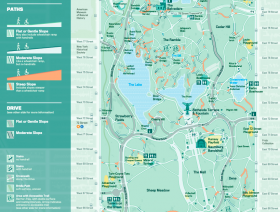 A new map from the Central Park Conservancy includes lots of new information about the park’s playgrounds, trails, restrooms, entertainment areas and other spaces that decodes the park for people with disabilities and/or limited mobility. Helpful information includes information on park terrain, letting visitors know how steep various trails are, and where there are stairs or other potential obstacles. 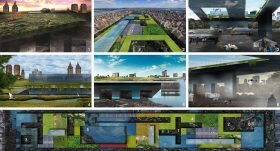 The University of Pennsylvania announced this week five winners of its ICONOCLAST competition, a design contest that asked participants to reimagine Central Park following a hypothetical eco-terrorist attack (h/t NY Times). The contest attracted 382 entries from 30 countries, all competing for $20,000 and the chance to be published in LA+ Journal. Richard Weller, a jury chair for the contest, said, “From megastructures to new ecologies and radical ideas for democratizing public space, the LA+ICONOCLAST winning entries can move beyond the status quo of picturesque large parks and embrace the challenges and opportunities of the 21st century.” Ahead, check out the designs of a recreated 21st-century Central Park from the five finalists. 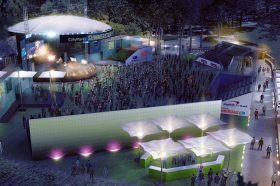 Rendering of the new, improved Central Park SummerStage; image courtesy of City Parks Foundation. CityParks SummerStage is New York City’s largest free outdoor performing arts festival, with 100 performances happening annually in neighborhood parks around the city as well as in Central Park from May-October–the majority of which are free of charge. In 2019, City Parks Foundation’s flagship SummerStage venue in Central Park will be getting a new stage, new sound system, more lighting, upgraded backstage areas, raised seating and an overall improved concert-going experience. Central Park’s beloved Delacorte Theater will get its first major renovation since it was constructed over 50 years ago, the New York Times reported on Wednesday. The Public Theater announced it has tapped architect Bjarke Ingels’ firm BIG to design a $110 million upgrade for the open-air theater, home to the free productions of Shakespeare in the Park. Kicking off in 2020, the project aims to reorganize the theater’s space, improve its resiliency, and make it overall more safe and efficient.